Nevertheless, it was not until after the Apparitions at Rue du Bac concerning the "Miraculous Medal" made to Catherine Labouré in 1830, and the establishment of a society dedicated to the Immaculate Heart of Mary, at the Church of Our Lady of Victories in Paris in 1836, that this particular devotion became really well known. The main difference between the devotions to the hearts of Jesus and Mary is that the one concerned with Jesus emphasizes his divine heart as being full of love for mankind, but with this love for the most part being ignored or rejected, while devotion to Mary's heart is essentially concerned with the love that her heart has for Jesus, for God. Honoring Mary's Immaculate Heart is really just another way of honoring Mary as the person who was chosen to be the Mother of God, recognizing her extraordinary holiness and the immense love she bestowed on Jesus as his mother, the person who was called to share in and co-operate in his redemptive sufferings. The aim of the devotion is to unite mankind to God through Mary's heart, and this process involves the ideas of consecration and reparation. 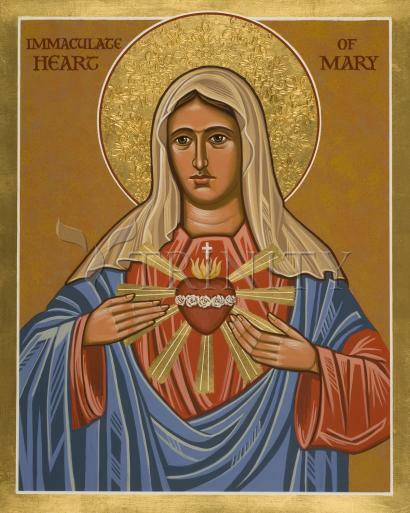 A person is consecrated to Mary's Immaculate Heart as a way of being completely devoted to God. This involves a total gift of self, something only ultimately possible with reference to God; but Mary is our intermediary in this process of consecration.